CORE has been fortunate in having attracted a number of overseas visitors to our Centre in the past few years. In 2011 CORE welcomed Gwenne van Rennes, a medical student undertaking a 5 month student internship as a part of her medical course at the University of Nijmegen in The Netherlands. During her time at CORE, Gwenne studied a programme that Paul O'Brien instituted called "intensive care". This is a programme designed for those patients who are struggling to lose weight following the Lap-BandTM procedure. Her research showed that the intensive programme - which includes excluding a device/anatomical problem then moving to a monthly follow-up programme - significantly improves weight loss. Additionally, Gwenne investigated the effectiveness and cost-effectiveness of intensive aftercare for LAGB patients with poor weight loss. 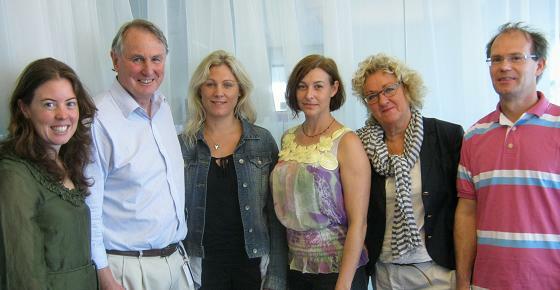 In early October Mr Peter Loonga, a bariatric surgeon from Sweden visiterd CORE with his team; Ina Frost Saxby (nurse), Katerina Lunner (psychologist), Marie Odin (nutritionist) and Josefine Jonasson (nutritionist). They visited CORE to observe clinical practice and to speak with our team about bariatric surgery and findings from our research. 2010 heralded our busiest year yet, in terms of visitors to CORE. On the international front, we welcomed Dr Stanley Terman, a psychiatrist from La Jolla, California, USA, Dr Ian Faneyte, a bariatric Surgeon from The Netherlands and Ms Beth Kramer, a bariatric Nurse Practitioner from Houston, Texas, USA. Locally, bariatric surgeon Dr David Deutscher was a visitor for a few days, as was Dr Georgia Rigas a bariatric physician from Sydney. The Netherlands continued to be a popular place for visiting studetns to originate from, as Ms Quirine Kymmell a medical Student at the University of Amsterdam joined CORE for a 4 month student internship, working closely with PhD student Kristine Egberts and Professor Paul O'Brien. In 2009, Dr Jun Kwong Hwa a bariatric surgeon at St Vincent's Hospital, affiliated with the Catholic University of Korea visited CORE for five days. Our staff also welcomed Dr Kent Sasse, the medical director of the Western Bariatric Institute in Reno, Nevada for two days. Students Sarah Cobourn and Paul Valiulis from Canada joined the research team at CORE for a little over two months, working with Professor O'Brien. In 2008 we had two overseas visitors, Assistant Professor Ayman Hassanen, Visiting Research Fellow from Egypt, who spent 6 months doing research working with Paul Burton and Paul O'Brien and Visiting Research Student Annelot Ochtman from Holland who spent 3 months at CORE working with Melissa Hayden. Visitors in 2007 were Dr Daniel Leslie, Assistant Professor of Surgery at the University of Minnesota and Ms Kristi Kopacz, a Physician Assistant, also at the University of Minnesota.